Yesterday, I pardoned a skirt that, in hindsight, should never have been on death row. My recent inspiration bath of stripes had me overly optimistic about my first attempt at matching them. The result showed promise, though. Enough to be a wearable muslin, for sure, but on one of those emotional days when my inner sewing teacher had no tolerance for imperfection, the skirt was put in a pile for sentencing. Outfitting myself for a Saturday of errands and the usual Mommy duties led to this outfit. What started out as a lazy attempt at looking human for the public ended up being the day I changed my mind about this skirt. It could be the floral scarf as half-turban thing (the humidity acts like reverse Kryptonite on my hair, something had to be done) that did it or I’d simply forgiven myself about the unmatched stripes on the right side seams. I mean really, no one can see both sides of me at once. And anyone trying to would look so hilarious darting back and forth in front of me that the whole incident would erase and replace the memory of any epic fail with epic laughter. On its first day out in the world, the skirt seemed to work out fine. But, my shame about how fumbly it was assembled (probably from looking at too many stripe-matching wizards showing-off on Instagram), had me convinced it was a wadder. I made it using the skirt and pocket patterns from the Colette Moneta skirt and some very lightweight cotton blend single knit from my stash. I machine-gathered the skirt with skinny clear elastic (per the original instructions) and topstitched on a two-inch elastic waistband. Because the fabric was so lightweight, I doubled it and skipped the hem for an unnoticeable raw edge that curls naturally to the inside. I’m kicking myself for nearly abandoning it. It is so damn cute to me now. 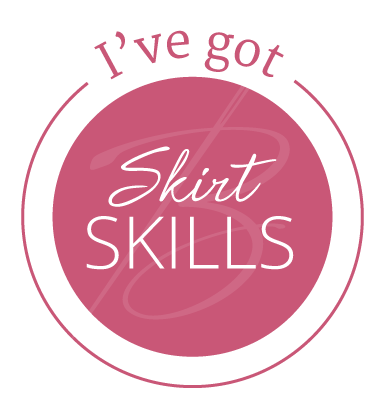 And, I’m certainly making more given how quickly the need for a skirt can be satisfied. I may even break my privately declared fabric buying moratorium to find another striped knit for Stripe Match the Sequel. Maybe even shoot for both side seams this time. Have you ever pardoned a make? What made you re-think it after giving up on it? This entry was posted in Somethings Sewn and tagged elastic waist skirt, Moneta, pattern hack, sewing blogger. Bookmark the permalink. Don’t feel too badly about your stripe matching here. The skirt actually looks very nice on you. I’m sure your next attempt with stripes will be a perfect success! Thanks for the encouragement, Faye. Yes, unfortunately I am regularly convinced that a project is not wearable. For example, I made a vest that was unusual and the fabric was kind of cheap. But it was my style of clothing and I grabbed for it and have worn it regularly. It was a little different and worked with what I owned. I am highly critical of any mistakes I make. That highly critical part of our brains needs a glass of wine. It’s good that we keep re-evaluating our garments, though. I find myself doing it when I need something to wear but don’t have time to sew (instead of shopping for ready to wear). It’s not just you. I get extra critical about what I make and half the time want to throw it in the trash. But I have to fight hard to forgive and allow mistakes and effups because basically I am still beginner who sometimes think she knows more than about sewing than she actually does.